Kulfi – am sure the very word sets the taste buds wagging amongst all Indians. A much-loved traditional Indian Ice-cream, it is such a wonderful dessert. The traditional version of Kulfi is fairly laborious to prepare but worth spending all that energy spent into making it. So when I was craving for something sweet and that which would remind me of back home, I thought to myself ‘why not make Kulfi’. Surfed through many a blog and websites, found that making Kulfi was indeed very time-consuming. So I decided to start searching for a short and sweet kulfi recipes. And I stumbled onto this wondrous quick as ‘Kesar Mango Kulfi recipe’. Aha…easy I thought to myself. Mix everything up and pour it into the mould and stow away into deep freeze. Now that’s more like it, then I realised I had to buy the kulfi moulds. Went to nearly 3-4 Indian grocery stores none of which had Kulfi moulds. For an alternative, I thought of ramekins and ice-cube trays. But these were such boring options!!! Then suddenly I recalled the image of my niece enjoying her popsicle. BAM!!! Eureka!!! Popsicle Maker to the rescue. I immediately drove down to the store and bought it. Take a mixing bowl. 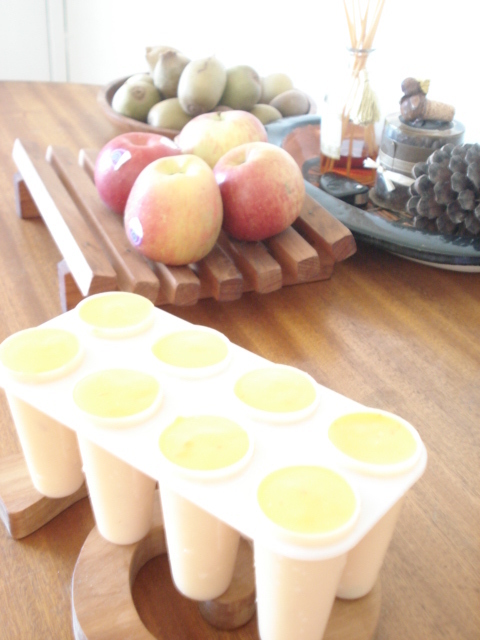 Combine mango pulp, sweetened condensed milk and sugar. Whisk until sugar is dissolved.Start adding thickened cream little by little. Throw in the saffron strands and cardamom powder. Whisk till the mixture is even without lumps or blobs. Add roughly chopped pistachios and mix well. 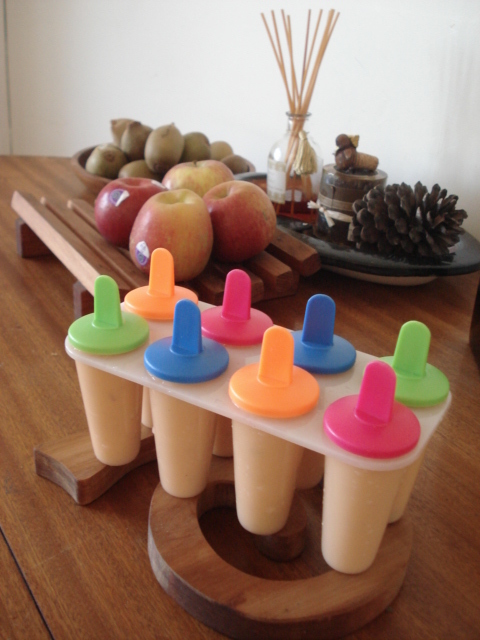 Pour the mixture into the popsicle maker and close with provided lids. Freeze for about 6-8 hours and enjoy. *** Best to let the Kulfi sit for a couple of minutes when taken out of the freezer. If you are having difficulty in pulling out the kulfi, try placing the mould under running water and twist it out slowly. *** The first time I made the Mango Kulfi it was without the cardamom. But when I tried my friend’s adaptation of this recipe with cardamom, I reckon this spice takes it to a whole new level. Don’t ask me why it’s called Thai Dragon Soup. I couldn’t find any information on the background of it. But the soup was a warm saviour on a freezing cold night. I bet you there is no easier soup recipe than this. No blending, adding cream, no separate preparations yadi yadi da….All that is too much work. But this Soup my friends is one of the easiest ones I have made. Sumptuous, nutritious and fulfilling. While browsing for ideas for quick dinner I came across a Thai Dragon Bowl Soup (http://gourmeh.wordpress.com/2011/03/21/499/) which is the original version and inspiration to my making this soup. 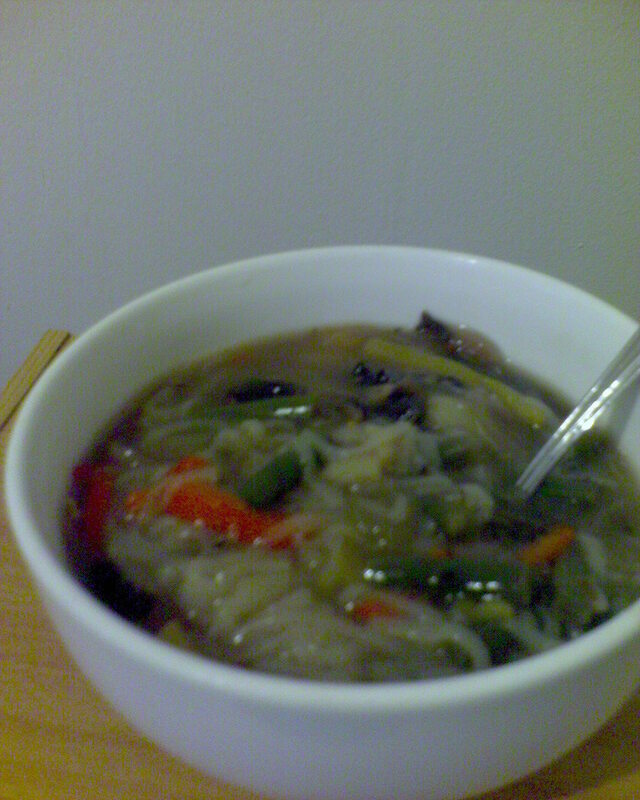 My Thai Dragon Soup was an adaptation of that recipe as my fridge wasn’t as well stocked for a proper dinner that night. I had no stock and I thought to myself if I dunk all veggies onto water with a bit of salt and pepper, my stock’s ready. So that’s exactly what I did. Boil water in a deep saucepan. Throw in crushed garlic, ginger, lemon grass stalks & all the veggies and let it boil. Season with salt and very little pepper as we have added the chillies already. So mind the heat! Once the colour of the water starts changing, add a small splash of Worcester sauce. It would roughly take about 15-20 minutes tops for the veggies to get cooked. When the water reaches a boil and the colour of the liquid turns a darker brown add the rice noodles. 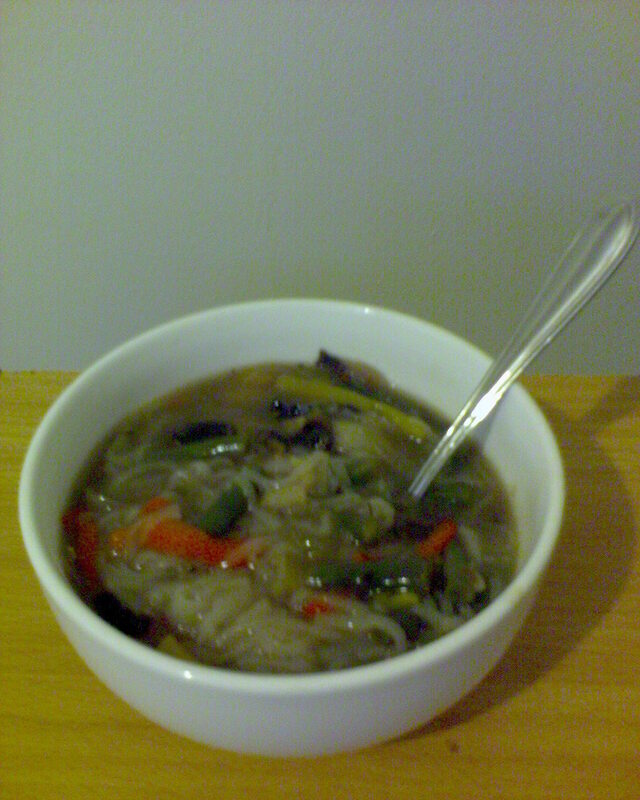 The stock would start to thicken after adding the rice noodle due to its starch. Boil until the noodles are soft and cooked through. Do not overcook as the noodle will absorb most of the stock which is why the noodle is added towards the end and is on the heat for just a little while. Once you remove the soup off the hob and let it rest for about a minute or so and splash in few drops of lemon juice which zests up the soup and takes it to a whole new level. Garnish with some coriander for that fresh flavour. There you go!!! Hot Thai Dragon Soup to keep you warm and give you the comfort food feeling.